Indian director Mira Nair has produced a sterling body of diverse films from the critically acclaimed Monsoon Wedding to The Reluctant Fundamentalist to the gorgeous period drama Vanity Fair featuring Reese Witherspoon as the social climbing Becky Sharp. Now Nair teams up with the beautiful Mexican-Kenyan Oscar winner Lupita Nyong’o (12 Years a Slave, Non-Stop) and British actor David Oyelowo in the Ugandan chess drama, Queen of Katwe. With a distribution deal by Disney, Nair has secured the way for Queen of Katwe to get a prolific cinematic release and a much wider audience appeal. 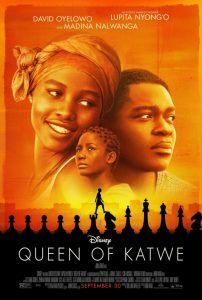 Queen of Katwe is a vibrant story of a young poverty-stricken girl Phiona Mutesi who is desperate to escape the dire circumstances of her neighbourhood and soon with the assistance of Robert Katende wonderfully played by Oyelowo, discovers an aptitude for chess, a strategic game traditionally played by young boys and men. Phiona, superbly played by newcomer Madina Nalwanga, has to battle teasing from the boys as well as her domineering mother Harriet Nakku wonderfully played by Nyong’o who is desperate to try and lift her family out of poverty. What Mira Nair does do is so perceptively is not dwell on the circumstances of poverty but on the hope that anyone can lift themselves out of a poverty stricken situation by applying their mind to their own talents and not let poverty trap them in a continuous cycle. This is exactly what the young and vivacious heroine Phiona does as she soon gains considerable recognition in the Ugandan and African chess world as she soon masters the strategic game and becomes a Ugandan chess champion, despite the odds. As the narrative moves from the smart private schools of Kampala to the icy streets of a Russian city and back to the shores of Lake Victoria, Queen of Katwe is a heart-warming African story about what can be accomplished when one realizes ones talent and practices religiously to succeed. 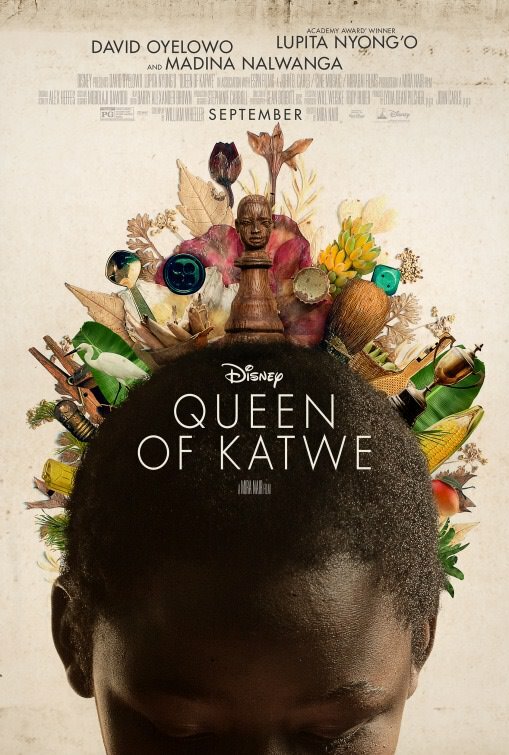 What makes Queen of Katwe so refreshing is that it’s a vibrant 21st century story of an African girl who becomes a champion in contemporary Uganda without any references to violence, dictatorial history or colonial repression, so different from such films as The Last King of Scotland. Mira Nair paints contemporary East Africa as a vibrant entrepreneurial area where the possibilities are endless. British star David Oyelowo (Jack Reacher, The Paperboy) should get an Oscar nomination for his superb performance as Robert Katende who gives up a stable job in the Ugandan government to ensure that the pioneers succeed. The pioneers are his chess club which aims to alleviate poverty through social upliftment and sport, which is exactly what happens to the courageous and intelligent Phiona. Queen of Katwe is based on an ESPN article by Tim Crothers and is highly recommended viewing. Intelligently acted by the three main leads and wonderfully directed by Mira Nair, this is an uplifting tale of human achievement. Indian director Mira Nair’s elegant and gripping film adaptation of the brilliant Mohsin Hamid novel, The Reluctant Fundamentalist is a riveting tale of cross cultural clashes which occur when a wealthy Pakistani Changez, played by Riz Ahmed goes abroad and studies at Princeton and then pursues a cutthroat career in global economics at a prestige New York firm, Underwood Samson. Hamid’s novel takes place as a dialogue between Changez confessing his love affair with America to a yet unidentified man at a cafe in Lahore amidst growing tensions in the wake of 9/11 and America’s war on terror in Afghanistan and neighbouring Pakistan. It is an elegant and evocative tale of how Changez, was offered the American dream on a platter and then see it disintegrate before his eyes under the horrific aftermath of the Manhattan terror attacks. In the midst of his shifting view of the American dream, from being strip search at JFK to being humiliated in America’s corporate and artistic worlds, Changez’s embarks on a cross cultural relationship with a liberated Upper East side conceptual artist Erica. Nair’s well crafted film version of The Reluctant Fundamentalist differs in parts to Hamid’s novel, exploring the inherent dangers of pursuing a Capitalist dream in a Western society which turns its back on you, in the wake of a Terrorist attack and the resulting shifts in American and Pakistani perspectives. The film delicately portrays the backlash suffered by many American Muslims living and working in the US, particularly New York in the aftermath of 9/11. Changez as one of the bright young stars, recruited directly out of Princeton for the international corporate fixer agency Underwood Samson by the sexually ambivalent Jim Cross as his mentor, gorgeously underplayed by Kiefer Sutherland (Flatliners, The Sentinel), is sent on global excursions from Manila to Atlanta to Istanbul to assist companies in downsizing their labour force and maximizing profits with their corporate maxim being focus on the fundamentals. At the start of his professional Manhattan career, Changez meets the dynamic and liberated Erica and soon embarks in a passionate affair. In Hamid’s novel , this complex romance is evocatively told as part of Changez’s confessions to a supposed stranger at the Lahore cafe. In Nair’s film version this doomed relationship reaches a climax in a particularly poignant scene at a swish Manhattan gallery opening when Erica’s displays her vision of conceptual art and inspired by her own relationship with Changez through the title: I slept with a Pakistani once. I slept with a Pakistani once. Erica, awkwardly played by an auburn haired Kate Hudson (Nine, The Skeleton Key), unburdens her own guilt by embarking on a rebound affair, as a way of dealing with the sudden death of her boyfriend Chris of which she was the supposed cause. While the relationship between Changez and Erica is not as well sketched out in the film, the ambivalent dialogue in the Lahore cafe is fully realized in the scenes between Changez and Bobby Lincoln an experienced CIA operative played by Liev Schrieber (Defiance, Salt and the excellent TV series Ray Donovan) who is trying to get vital information out of him about a suspected Al Qaeda kingpin operating in Pakistan, whilst also suspecting him of masterminding an established or imagined terror network. 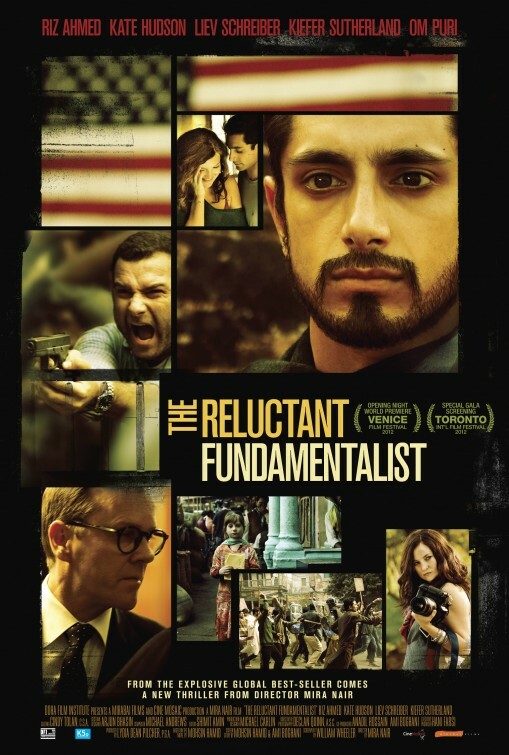 The Reluctant Fundamentalist expertly delves into the disillusion of the American dream from a Pakistani perspective. 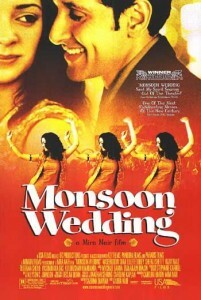 Like other Mira Nair films always with a flair for the dramatic most notably Vanity Fair and the award winning Monsoon Wedding has stunning production values, compliments this visually rich film with a wonderfully evocative soundtrack. The film’s script by Ami Boghani intelligently explores the common ties of humanity despite different cultures and the journeys of self discovery required to fully appreciate the fundamentals of a fulfilled existence. The Reluctant Fundamentalist is a an ultimately flawed but brilliantly told international thriller which is better appreciated if viewers have first read the novel. Recommended viewing. 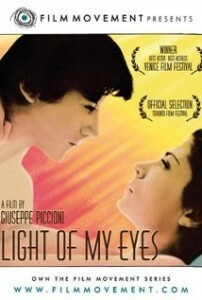 in late August, early September and is the oldest Film Festival in the World. William Makepeace Thackeray is best known as the author of the seminal novel about British life during and following the Napoleonic Wars in the wonderfully descriptive, incisive and popular novel Vanity Fair. Published in 1877, the novel remains as relevant today with language and style which is as accessible in the early 21st century as it originally was in the 19th century. Vanity Fair was not a Dickens or an Eliot novel, all social realism and stark morals but light, sharp and ironic with Thackeray weaving a vast plot with a huge collection of characters with flair and dexterity always keeping the reader in his sardonic sights, whilst remaining poignant, acerbic and darkly entertaining. Vanity Fair follows the fortunes of Becky Sharp, the heroine a governess who becomes an artful social climber and marries into the wealthy Crawley family, illustrating how unscrupulous and brilliantly wicked and willful a heroine can be. The novel is episodic by nature and weaves many tales surrounding Becky’s rise and fall and rise again in the colourful and notorious Regency period in England, when as a nation, the British were establishing themselves as an Imperial power to be reckoned with. Renowned Indian film director Mira Nair who brought the colourful and joyous Monsoon Wedding to international cinema, was at the helm of the film version of Vanity Fair, featuring the surprising but clever casting of American sweetheart actress and star of Legally Blonde and Cruel Intentions, Reese Witherspoon as Becky Sharp supported by a vast sea of British actors from Oscar Winner Jim Broadbent to Jonathan Rhys-Meyers of The Tudors fame to a lesser known Robert Pattinson, now famous as Edward Cullen in the Twilight Saga. Whilst novel and film are two entirely different mediums both can be appreciated the first being a great social commentary of the emerging British Empire and the film as a sparkling and lavish period tale with exotic settings from Belgium and Bath to Baden-Baden ending with a vibrant colourful elephant ride in India. Rereading Thackeray’s Vanity Fair certainly reveals how little has changed in high society over the centuries with nations still as obsessed with wealth, pride, status and ambition while stronger individuals take advantage of the weak for the benefit of securing more power and fame.